ATTO bridge and storage controller products are engineered to effectively transfer data with minimal overhead from multiple combinations of protocols and custom applications to meet specific customer needs. ATTO’s intelligent Bridging Architecture technology combines powerful hardware with an efficient software data engine to deliver valuable features with the flexibility of “anything to anything” connectivity. Examples of anything to any- thing protocol interaction include FC to SAS,FC to iSCSI, FCoE to SAS, FC to SATA, FC to InfiniBand and Ethernet to NVME. Protocol interaction is primarily the movement of data and metadata. This movement of data/metadata is affected by hardware and software components that are designed into the bridge. 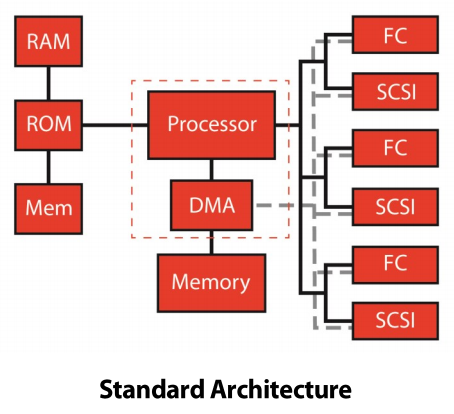 The design and relationship of these components is the heart of intelligent Bridging Architecture. Storage OEMs and integrators require robust connectivity solutions that add value with limited additional overhead. The breadth of solutions available via the Series Architectures found in the Data Routing Fabric and the depth of applications via the flexibility found in the Drive Map Director allow ATTO’s intelligent Bridging Architecture to exceed OEM and integrator needs far into the future. Its flexibility allows us to match price and performance requirements to each level of the market. This means our customers can incorporate the value add features of our product into their product while maintaining their market level price strategy. It provides a common software platform throughout the family. This means our customers can begain using ATTO storage controllers where the fit is most critical and extend throughout their range of products with minimal interruption or qualification obstacles. It is the platform for adding value into the storage controller and into the final solution. Customers add value into their products beyond just native connectivity; the physical connections on the storage controller enable ATTO software to allow translations so two different protocols can communicate with each other. Additional functionality enables industry required applications like device mapping, extended copy or device virtualization. An ATTO storage controller provides customer-specific applicaitons such as diagnostic functions and email notification to become part of their solution without additional development. There are two primary components in intelligent Bridging Architecture: Direct Routing Fabric and Virtual Device Manager. ATTO storage controllers are designed to offer OEMs a level of price and performance in concert with their targeted market pricing. This allows OEMs to incorporate the multiple value add features provided by intelligent Bridging Architecture at justifiable price points. Virtual Device Manager works by allowing ATTO engineers to create virtual devices specific to accomplishing the individual tasks and applications within the storage controller. These devices are called virtual because they only exist in the firmware. The variety of devices is limited only by imagination and programming capabilities. 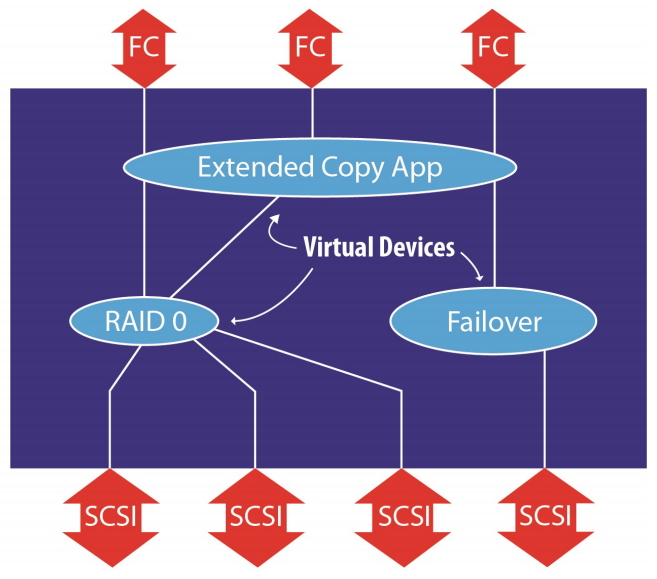 The collection of devices in a storage controller makes up the Virtual Device Manager. The ability to provide anything-to-anything connectivity is a key aspect of the Virtual Device Manager. By designing connectivity interfaces as a virtual device, ATTO can tailor a solution by changing only the interface virtual device, leaving all other aspects of the storage controller intelligence common. This also allows newly developed connectivity interfaces to be ported between product family members. In addition, a stable code base means minimal qualification requirements as product adoption across a customer's line increases. The significance of this stable code base across the product family means customers can choose a product to fit immediate requirements while offering the flexibility to design OEM value added features in the longer term. Taken a step further, this allows ATTO and our OEM customers the ability to differentiate our products from the competition as well as between segments of our own product lines. In addition to offering anything-to-anything connectivity and flexible customization, intelligent Bridging Architecture acts as a portal to the SAN by providing SAN-management configuration tools and information. This means that the customer can optimize the storage controller functionality within his SAN. Storage OEMs and integrators require robust connectivity solutions that add value with limited additional overhead. The breadth of solutions available via the Series Architectures found in the Data Routing Fabric and the depth of applications via the flexibility found in the Virtual Device Manager allow ATTO intelligent Bridging Architecture to exceed OEM and integrator needs far into the future. ATTO intelligent Bridging Architecture is a key component in the success of storage OEMs and integrators. Combined, these technologies create ATTO's bridging technology that goes beyond the standard to deliver a total system approach to storage connectivity and infrastructure management. Lower integration cost due to reduced number of qualifications.